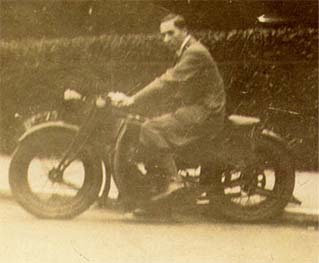 Lindsay atop Rudge, circa 1927.
. . .with coupled brakes, an innovation. 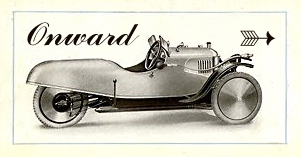 From 1914 for several years, Rudge won the Isle of Man Tourist Trophy races. Still, there were critics whose slogan was "Rudge, Trudge." [I, the Editor, had my own Rudge that I loved in my high school days four decades later. This Rudge, a distant descendant, was an unmotorized "English" bicycle with the customary Sturmey-Archer 3-Speed controller mounted upside-down on the right handlebar. I was delighted by its front wheel Dynohub that provided a constant few volts for the headlamp and, as a later experiment, to a portable reel-to-reel tape recorder I strapped to the rear book carrier and would grind up to speed if I was going downhill. It was a rugged ride and suitable to the four-season off-roading I often tried with it. 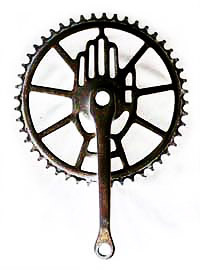 My favorite part, however, was the large sprocket wheel, with a logotype hand shaped into the design.